This bumps the middle version number, which means physics change. If you'd like to play tonight, you need this one, or the server won't let you in. But I've fixed a couple annoyances in multiplayer, I hope it's worth it. All singleplayer levels are still solvable. Raymanni's Toy, Lab, and Gore tilesets to v3: Raymanni has drawn Lab monitors, Gore tentacles, eyes, and a bonesaw, a Toy chalkbox, and several more. All tiles have shading from the top-left as normal for Lix tiles. Thanks! Added Proxima's and mobius's multiplayer levels, merged geoo's level changes for the tileset update. Level search. In the singleplayer or multiplayer level browser, you can search the entire level tree for titles or filenames. Fix #239: The server sends a permutation of correct size. This fixes wrong hatch/goal distributions in games with many observers and larger teams. Fix #217: Skip remaining overtime when everybody has nuked or finished playing. Race maps (= maps that have zero overtime) nuke automatically on the first scoring. Fix #240: Observers don't have to cancel the end-of-game dialog anymore. I print the game result to the console. This is not beautiful, but it's an acceptable medium-term solution. * If, as an observer in multiplayer, you are on the level selection menu when a round starts, you are stuck there and cannot exit, even when the round finishes. I had to close and re-open the game to continue participating. * Tab (should change which player's skillset you can see) doesn't do anything. * Rubix's Going Up? 7p and 8p both appear in both the 7p and 8p folders. This is old feedback, but now that we're getting 6/7/8 people more regularly, it really needs addressing: while you're in the level select menu, you should receive notification when someone else has selected a level. Rubix's maps remove duplicates: Done, already on github. Will be in next release. Tab should choose spectated team but does nothing: Missing feature. I had the button remappable because I populated the options menu in one go. Feature is not high-priority, I'll probably remove the widget in the options menu until feature is done. Observer in level selection gets stuck: Interesting, I never thought observers would dig for maps, but it's of course possible. Excellent catch. Notify in map browser when other player selects map: Agree that this is important. I want at least a sound effect for now. A long-term solution must be even clearer than a mere sound. Fix #243: Sounds play in the lobby or browser when somebody joins or when somebody picks a map. When observers browse for maps and others start a game, the observer's browser closes, and the observer will see the game. Fix #244: Malformed UTF-8 in files within the level tree (e.g., zip archive) won't crash the Lix level search anymore. The offending file still will not appear as a searchable level; instead, the offending filename is logged. I validate all keyboard input for UTF-8. Fix #246: Tiles with coordinates far out-of-bounds crashed the editor once torus wrapping became enabled. Will now torus-wrap these tiles properly. Fix #247: The lix under the mouse is lighlighted far brighter and gets a dark outline to its left, right, and above it. Fix #248: Multiplayer colors: Purple is lighter. Black is darker. Yellow is darker and has less green hue. Added about 40 remakes by Proxima of maps from 2009. I've inserted the maps in their original authors' directories. Thanks a lot for your work! Removed a backroute in lemforum's Duality from abusing decoration. Removed hidden water in Sharing the Water Supply 4p. Removed duplicate map files for Going Up 7p/8p. Rubix reordered his singleplayer levels and added the Community Collab Project: 4 levels in single/rubix/Extras. lemforum: Path to Mahiman, removed indirect jump backroute. Runaround up to Cunning, Rainbow Road down to Quirky. Fix #252: Level search queries won't match the prefix 'levels/' in the filenames because all levels would match. Fix #256: When you export levels to images or save replays manually, the button replacement will not say "done", but instead tell you the filename. Fix #254: When you run out of VRAM during a level, the game won't crash, but instead stop making internal savestates. This won't display a warning, it will merely log. Recalculation due to incoming network packets will take longer, but that's better than crashing. The game remains VRAM-hungry (it allocates up to 10 copies of the entire land VRAM bitmap) and this solution is not ideal. Music: Download the music collection and extract into your Lix root dir. You can create additional subfolders in ./music/ and put your own tracks inside -- ideally as .ogg, .mod, .xm, .it, or .s3m. Lix will play a random track per level. Fix #216 #261: The manual savestate function will now always overwrite the savestate replay with the current replay. Improved the mouse handling on Windows, there should be fewer odd jumps of Lix's cursor over half the game window. ClamLix isn't finished yet, and the splat ruler should not be always-on. Postponing these two features for future Lix releases, but we're working on them. Fix #216: The manual savestate function will now always overwrite the savestate replay with the current replay. Isn't it fix #261 or am I wrong? Yep, it's #261. Fixed in the bugtracker, thanks! ClamLix is included, a singleplayer pack with 113 levels. All levels are proven solvable. Thanks, Clam, Forestidia, and mobius! New multiplayer maps by Arty, Flopsy, and Yung. In particular, more maps for 7 and 8 players. Some fixes to multiplayer maps by geoo and Steve. lemforum's Eye of the Needle: removed a backroute. Rubix's Holly Jingle: save 99/99 -> save 10/10. Fix #257: When A's lix enters B's exit, B will hear the saving sound. Splat ruler. 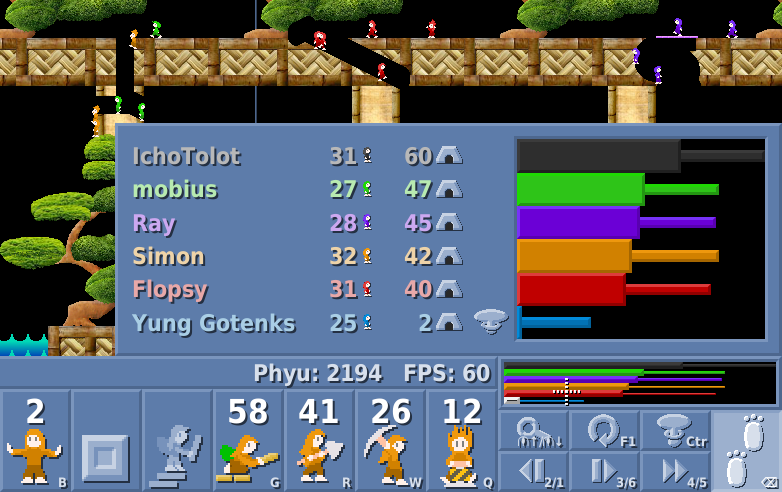 In multiplayer, the splat ruler is combined with the exit-highlighting-function. Needs feedback. Score graph marks players who nuked with black-and-white squares. Ideally, I find a better solution. Fixed an assertion failure in the debugging build when dragging quickly in the editor. Fix #258: The multiplayer server crashed when somebody left, then the remaining players started a game. Still needs field testing. Optionally, extract the music collection into Lix's root directory. In NepsterLix/Moon, 10 levels got backroute fixes on 2017-11-30. All levels are proven solvable. In ClamLix/Outtakes, beautified Korean Border Crossing (version from 2017-12-13) and Abridged Version v1. All levels remain solvable. Merged multiplayer maps by Arty: Blow Your Top, Shaft of Chaos, Showdown at Chainsaw Gap. Distinguished the pillars in matt/bricks from steel by yellow-brown color. Still to do: Distinguish pillars in geoo/construction from steel. Fix #272: Always draw splat ruler in front of terrain. Draw splat ruler even when it doesn't snap to anything. Fix #263, fix #269: Network game computes correct overtime when somebody nukes before saving lix, then saves some. This fixes crashes from assertion failures in the debugging build. Fix #209: The replay verifier called from the replay browser creates checkmarks when it finds solving replays whose player name matches the user's name. Command-line verification doesn't create any checkmarks. Fix #271: Verifier distinguishes normal failures without lix left from failures from running more than 5 minutes after the final skill assignment. Fix #157: Playing back winning replays on a wrong level version turned your correct checkmarks into '?!'. Now, replays will only affect checkmarks when the played level matches exactly. Fix #260: When you interrupt or modify a replay, then save it, your name replaces the old player name in the replay. Better key names on Windows when remapping hotkeys. If you still see keycode numbers instead of a proper key name, please tell me key and number. Translated leftover options to German: Sound and music volume, fast movement frees mouse, unpause on skill assignment. Fixed links in the build instructions that were still pointing to asdfasdf; they now point to lixgame.com. I just noticed that it doesn't seem to disable if you lose and chose the menu option for level restart. Is that intended? Bug, coming from bad duplication of code. To update, extract over old installation. Alternatively, extract to new directory, then copy the directory data/user/ and the file data/config.txt from old installation into new. Added Raymanni's Holiday tileset. Thanks so much for this beautiful set! Rubix's singleplayer, reduced initial lix in 3 levels to combat long waits when route is finished. Cropped small lemforum/Quirky maps with repeating decoration from 640x400 to 640x320. Compression Method 2 has a 2nd hatch. Fix #251: geoo/construction/pillar_* looks hexagonal instead of round, and looks more like concrete, to avoid confusion with steel. Thanks for overhauling this tile! Fix #79: geoo/construction/squisher.T has a flashing exclamation sign and looks different from pillar terrain. It's now clearer where terrain ends and where the trap begins. Fix #253: Level search matches the level author, too, not merely the level's name and path. Fix #222: When you enter a different windowed resolution, (un)check windowed/fullscreen, or load a user config file, the program immediately switches to the desired resolution and screen mode. You don't have to exit and restart. Fix #249: Editor, rectangle dragging: Prefer to drag 1xN rectangles instead of (full-width)xN on torus maps. Fix #219: On torus maps, editor draws hatch/goal annotations properly across torus seams. Why have you decided to put the music in the main release and not anymore as optional download? Userfriendliness? Or because it's now seen as part of the game? Music is in main download because it firmly belongs to the game, and the few extra MBs don't matter much. I don't want it in source control and should find a good long-term method. Originally, I thought that if it's too fat for source control, then it's too fat for the standard download. But the standard download is unrelated; I could still take out the music if we ever have far too much music.